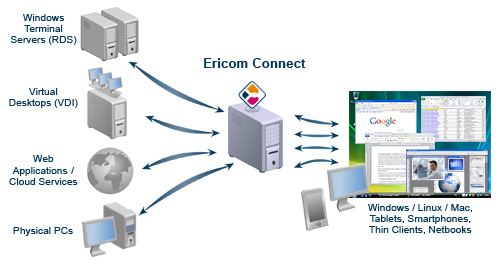 Ericom's Secure Remote Access Solution – Ericom Connect® – provides flexible and secure enterprise-wide access to business-critical applications, desktops, and data. Ericom Connect empowers organizations to respond to a broad range of challenges while enjoying unprecedented ease of implementation and use, flexible scalability, great user experience, cost performance and many other benefits. Ericom Connect is fast and simple to configure, intuitive and cost-effective - ideal for companies with remote branches, telecommuters, and external contractors / third party personnel. Remote access to the corporate network can be secured using the built-in Ericom Secure Gateway or your existing SSL VPN.